This tour provides approximately 2 hours of free time at the Dam - where you can go on the two-hour guided discovery tour, visiting the exhibit gallery, penstock viewing platform, visitor center and more. Why not upgrade your tour to include a lunch at The Hoover Dam Lodge followed by a visit to the Ethel M Chocolate factory? To make the most of your day, you have the opportunity to include a memorable 90-minute cruise on the Desert Princess paddle boat to enjoy the delights of boating on the largest man-made lake in the US. A picnic style meal is served aboard the boat. 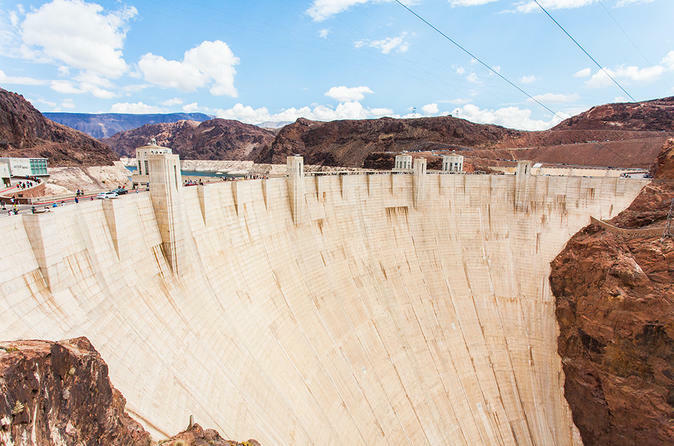 Regardless of which option you select, you'll enjoy phenomenal views of Hoover Dam, admire the beauty of Lake Mead and see the colorful Arizona Paint Pots in stark contrast against the volcanic rocks of Black Mountain. Special Offer - Book with us and save 31% compared to another travel site! - Book Now!